If you are expecting a little bundle, you have a lot of options when it comes to choosing a bed for them. 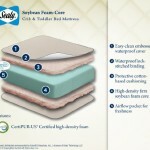 There are different crib styles and different crib mattresses to choose from. 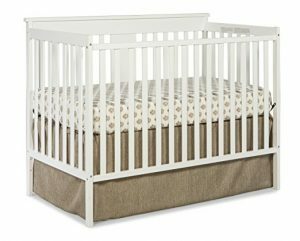 Many people feel that they need the full sized crib and mattress set, but often either space or finances do not allow for the traditional standard cribs. This often means that parents put their little one into a playpen or something similar. You do not have to do this. You can have a smaller version of the traditional crib in a mini crib. 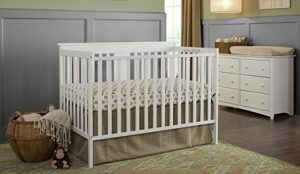 In case you have not heard of them before or ever considered them as a possibility, here you will find information on how to find the best mini crib and mattress for your home. What is a Mini Crib? One of the major differences is the size of the mattress required. 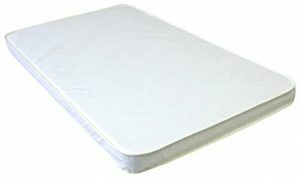 Standard crib mattresses are going to measure 28in wide and 52in long, whereas a mini crib mattress will measure 24in wide and 38in long. Another big difference is that standard cribs are fairly stationary and pricey, but mini cribs are designed for travel and convenience. 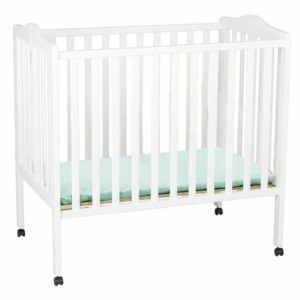 They are also typically cheaper than the standard sized cribs. Is Bigger Really Better, or Worse? Many people choose the traditional crib based on the idea that is what a crib is supposed to look like in their opinion. However, a mini crib is ideal for parents who want to travel to grandma’s house for visits or have a space that is limited. They are more portable and obviously, they are space saving. Mini cribs are more practical if you want to have the baby sleep in your room, but you do not have a lot of space to spare. 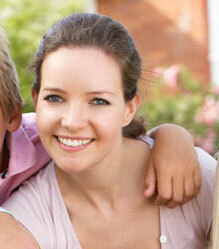 They are great in homes where the baby may spend most of their time napping in a living room instead of the nursery. The truth is, there is no real difference between the two cribs. It is a personal preference and you should choose the one that fits your life. To help you understand what is available and what makes the best, why not take a look at the mini crib reviews below? As your infant grows, this mini crib can change into a daybed or a twin size bed, but the frame is not included for the bed. 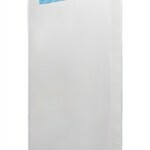 The mattress support system offers three positions and it is easily adjustable. All that you need to assemble the mini crib is included with your purchase. 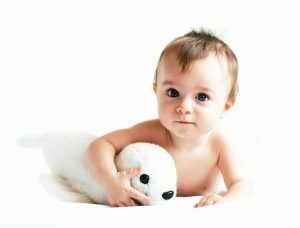 It is ASTM and CPSC certified to ensure safety and comfort for your baby. 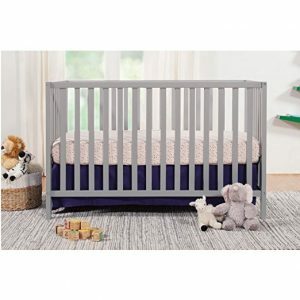 You can choose from 4 finishes on this pine wood finish mini crib. This is one of the best mini baby cribs for travel. It is lightweight and folds flat when you want to take it with you on a trip. It offers two positions for your mattress and even though it is portable and folds down flat, it still meets all safety standards for cribs. 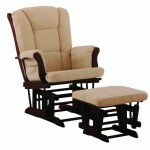 It has a stationary front and back rail, 4 casters, and it is all made of wood that is available in three colors. 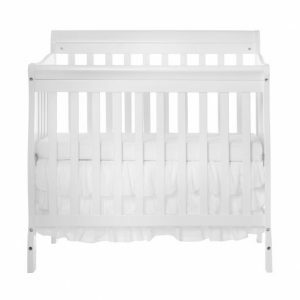 This crib is completely lead and phthalate safe to make it nontoxic regardless of which color you choose. It meets all safety standards and allows you to reach your little one easily thanks to its low profile. The mattress is supported on two levels. 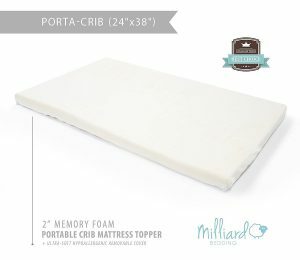 With this crib, you will also get a 1” waterproof changing pad. 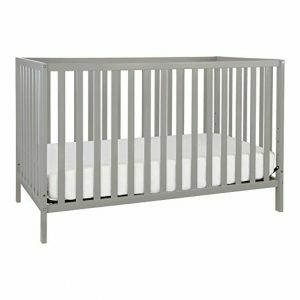 This crib is available in three color choices including pebble gray, white, or espresso. It converts from a toddler bed to a daybed and even a full-sized bed with a headboard and footboard. The frame for a full-sized bed is not included. 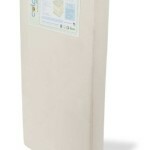 The mattress adjusts to three positions and meets all ASTM & CPSC safety standards. There is also an included 1-year limited manufacturer’s warranty. It weighs in at only 54 pounds. This convertible bed changes from an infant bed to a daybed and then to a full-sized bed. It has adjustable mattress heights. 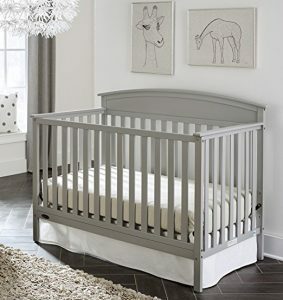 It is made from solid pine wood and has a non-toxic finish whether you choose the white, espresso, or gray crib color. It holds a steady 4.3-star rating. It weighs in at only 46 pounds and measures 30 x 53.8 x 42.5 inches. 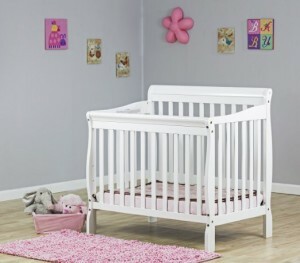 This beautiful crib comes in one of five color choices to ensure it will look great in your nursery. The crib is completely nontoxic and converts from a crib to a daybed and toddler bed. It has four mattress position adjustments and it is made of New Zealand Pine. If you choose the mattress that was designed for it, it is free of adhesives, lead, and toxic flame retardants to provide your child with a hypoallergenic sleeping surface. Overall, it has a rating of 4.5-star. 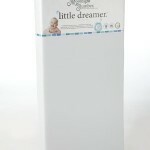 This organic mini crib mattress is waterproof and free of adhesives, lead, phthalates, and TRIS. It is also free of all toxic flame retardants that other mattresses may have. The cover is triple laminated to ensure waterproofing. It has a border wire to ensure durability and 50 coil tempered steel springs to ensure stability. 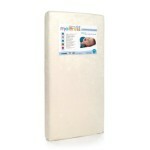 This mattress can resist flames and it is made with a non-allergenic anti-bacterial waterproof cover. It fits well into standard portable cribs. It is made in the USA and meets all safety requirements. This mattress weighs only 1.9 pounds to make it easy to take wherever you need to go. This mini crib mattress holds a 4.2-star rating. 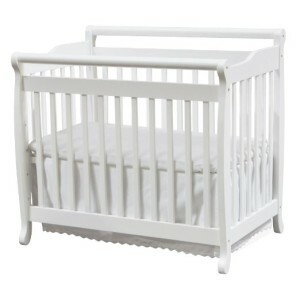 It is tear resistant and fits any standard sized portable crib. The cover has a dust mite barrier and it is completely hypo-allergenic. It is also stain resistant and waterproof so that you can keep it clean with only soap and water. 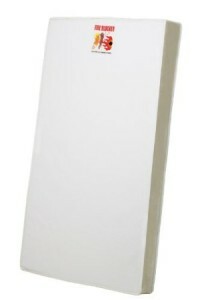 It measures 24” x 38” x 2” and has a one year warranty. This topper is designed for use with portable cribs. 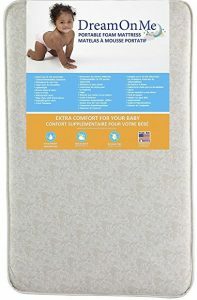 It is able to provide more support and comfort for your little one. 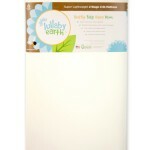 It provides your little one with a better night’s sleep because they will toss and turn less. 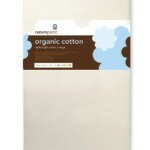 The removable cover is waterproof, but it can be washed and dried along with your regular wash. It holds a bestseller ranking and 4.3-stars from the parents who love it.